There are many possible subjects: in an urban context, on an operational industrial site, on a brownfield site, with pollutant problems, whether organic or inorganic, recalcitrant or not, and affecting soils, the surface water table, the deep water table, etc. 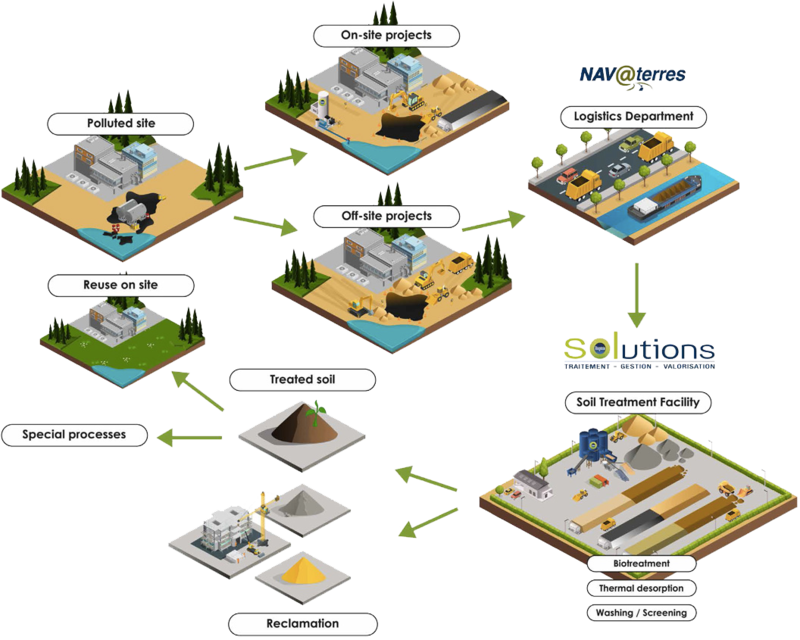 Biogénie responds to your soil and water table contamination problems via a strategy that is systematically adapted to suit your context. By integrating robust and efficient decontamination technologies, by always being transparent with you concerning the risks inherent in this type of project, BIOGENIE gives you security in terms of costs and deadlines. Thanks to its logistics team, its large and loyal network of transport partners, and its NAVterres platform, BIOGENIE offers you extremely efficient transport and processing services that are responsive and respect the highest environmental standards. After processing, the soils are (chemically) biostabilised, their agricultural capability is preserved, and they satisfy all the points stipulated in our bye-laws concerning the procedures for their reclamation. Through its washing or kneading/screening facilities, BIOGENIE produces noble, perfectly inert materials that are useful for civil engineering works (various fill materials, construction materials, etc. ): sands (0/4), type 4/20, 20/60, 0/31.5 siliceous rubble. We offer you recycled materials on our platforms so that you can get the fill material you need at lower cost and optimise your transport costs via return loads.